It all begun last century! It all began last century! ​Not the hieroglyphic writing, I mean, that's older. Somewhere around the end of last century, I visited Bush Gardens Florida (Tampa). One of the attractions was a perfect replica of Tutankhamen's tomb, with all of the original artifacts in the original places (OK, they were reproductions....) The visit sparked my curiosity for Ancient Egypt and, in particular, for its fascinating writing system. I purchased a copy of "Hieroglyphs without Mystery: An Introduction to Ancient Egyptian Writing" by Karl-Theodor Zauzich and Ann Macy Roth in the gift shop and the hieroglyph bug never left me! I soon realized that there was no computerized flashcard system (Anki was not around at that time) to help me learn the language. ​From that realization Hierowords was born. Thanks to the wayback machine, you can still visit the original website (for a while, at least) by clicking here!. 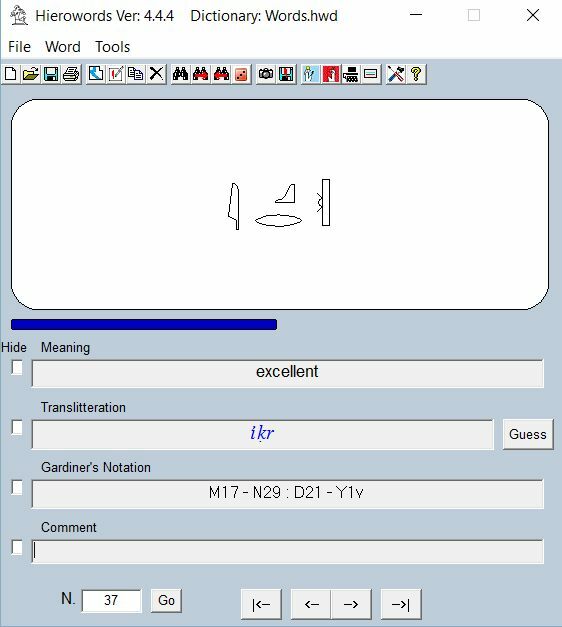 Initially I intended it just as a flashcard program, but over the years it has grown to be a full fledged computerized dictionary mostly due to the passion and dedication of a few committed egyptophiles who have entered thousands of definitions! By far the most committed user is Mark Vygus, who has entered tens of thousands of definitions (!) gleaned from many different sources.